The new Wakefield Street Neighbourhood Free Library is available as a 24/7 service to book lovers. Pick up a book any time that suits. 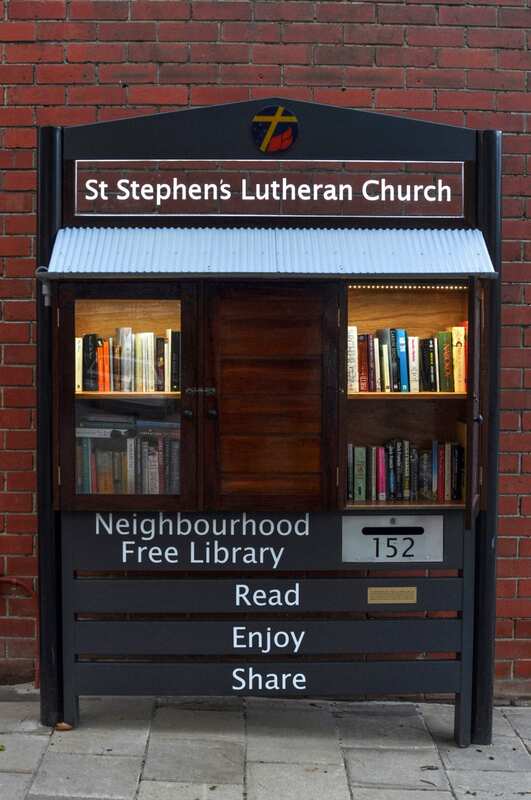 The street library in the church forecourt of historic St Stephens was built by carpenter Ian Wurst from a design by emerging artist Pat Welke and support from the Adelaide City Council. Ian’s unique feature is strip lighting which allows it to be available for people to choose a book at any hour. Passer-bys can take free books that cater for a wide range of interests, including kids’ books. Log seats are provided for people with time on their hands who want to browse or enjoy a break with books.